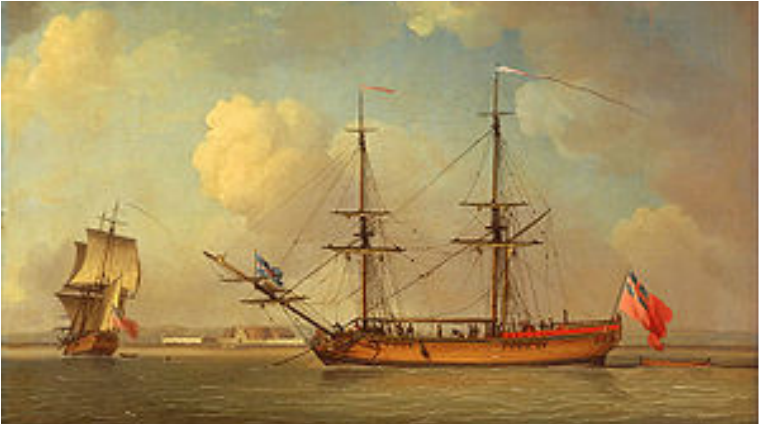 View of two snow rigged vessels of the type commanded by Hugh Percy that brought Hans Adam Budinger with his wife and family to America in 1737. Painting by Charles Brooking (1759). Hans Adam Büdinger, the founder of the Bedinger family in America, was born in 1698 in Ottwiller, a small village that can be found on present-day maps of the Alsace region. His birth name was recorded as Johann Adam Büttinger in the records of the Protestant church in Ottwiller. At that ​time Ottwiller was in Lützelstein, an ephemeral state of the Holy Roman Palatinate based around the village of Lützelstein (La Petit-Pierre, as the French village is known today) in Alsace in northeastern France bordering Germany. Since 500 A. D. the region has been populated predominantly by Germans, but historically France and Germany have vied for possession of Alsace. France gained control of Lützelstein with the annexation of Alsace according to the Treaty of Ryswyck in 1697 at the end of the Thirty Years War. Hans Adam Büdinger, with his wife and four children, accompanied by his brother Peter, his wife and two children, departed Durstel, Alsace probably in the spring of 1737 for the arduous journey to Philadelphia that took probably one-half year. They traveled down the Rhine River on a barge to Holland, where they took passage on the ship Samuel, commanded by Captain Hugh Percy, which sailed from Rotterdam. Sailing from Rotterdam the ship stopped over at Cowes on the Isle of Wight because it was required to make port in England before making the trans-Atlantic voyage. The ship Samuel landed at Philadelphia August 30, 1737, whereat the courthouse all males of age sixteen or older were required to sign the oath of allegiance to the British Crown and an oath of abjuration. [vi] The Philadelphia Courthouse is believed to be the very building, now known as "Independence Hall", where nearly two-hundred forty years later the Liberty Bell hung and the Declaration of Independence was read. A narrative of the hardships and dangers of the arduous journey from Alsace to Philadelphia is told by Gottleib Mittelberger, a traveler who made the trip in 1750. The ancestry and descendants of Hans Adam Büdinger are given in the section on Bedinger Family. [ii] Longhofer, Jeffrey. "Mennonites." Encyclopedia of World Cultures. 1996. Encyclopedia.com. 16 Jan. 2016 <http://www.encyclopedia.com>. [iv] Longhofer, Jeffrey. "Mennonites." Encyclopedia of World Cultures. 1996. Encyclopedia.com. 16 Jan. 2016. <http://www.encyclopedia.com>. [v] The book on the Bittinger and Bedinger families by Lucy Forney Bittinger states that Hans Adam was encouraged to immigrate to America on the advice of his friend of Dr. Mühlenberg, a noted Lutheran divine of the day. From a study of Dr. Mühlenberg's biography [a] one would conclude that there was no opportunity for the two to meet before Hans Adam immigrated. Dr. Mühlenbergborn born at Einbeck in Saxony was about thirteen years younger than Hans Adam Büdinger and was a student at Georg-August University of Göttingen in 1737, the year the Büdinger immigrated. Dr. Mühlenberg immigrated to Pennsylvania in 1742 and became the widely acclaimed patriarch of the Lutheran church in America. We believe that L. F. Bittinger knew of the association of the two men in Pennsylvania during Dr. Muhlenberg's travels to the Lutheran congregations in Pennsylvania. [a] Mann, William J.,1888, Life and Times of Henry Melchior Mühlenberg, G. W. Frederick, Philadelphia, 547p. [vi] Strassburger, Ralph Beaver, 1934, Pennsylvania German Pioneers, ed. William John Hinke, Pennsylvania German Pioneers, Pennsylvania German Society, Norristown, Pennsylvania, 771 p.
[vii] Bittinger, Lucy Forney, 1904, Bittinger and Bedinger Families Descendants of Adam Büdinger, published by the Author, Sewickley, Pa., 63 p.
​[viii] Gibson, John, 1886, History of York County Pennsylvania, F. A. Battey Publishing Co., Chicago. [ix] Dandridge, Danske, 1909, George Michael Bedinger, A Kentucky Pioneer, The Michie Company Printer, Charlottesville, Virginia, 232 p., p. 4.